Honeywell’s Type 4 safety light curtains. 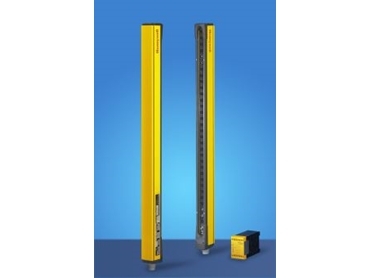 HONEYWELL has introduced the FF-SYA234 Series range of Type 4 safety light curtains for access control to dangerous areas near factory machinery. It conforms to IEC/EN 61496 parts 1 and 2, and is CE marked. Available in 2, 3 and 4 beam versions for body detection, it offers a variety of safety sensing and control options in a user-friendly and easy to use package. The FF-SYA234 series offers two cross-monitored static safety outputs with short circuit and cross fault detection. An internal dc/dc converter avoids the need for a galvanic insulated power supply, and a connection to existing 24V dc power supply networks is possible. The multi-beam system is self contained and compact (42 mm x 55 mm), offering three selectable scanning ranges up to 80 metres. This avoids cross-talk with other devices, and allows it to be used with mirrors to guard the perimeter of a large machine with only one emitter and receiver. The FF-SYA234 series is well suited to use in heavy industrial environments, and the optional FF-SRS59392 safety control module provides additional features, including FSD monitoring. The control module is fitted with two cross-monitored safety relays and switches from 10mA/10V dc to 6A/250V ac. Honeywell 1300 363 936.